The 1960s saw the city of Adelaide go through significant changes. The magnificent Jubilee Exhibition Building on North Terrace - built in 1887 for Queen Victoria's Jubilee came crashing down in 1962, replaced by the ugly Napier Building in the University of Adelaide. Gresham Hotel facing Parliament House was demolished in 1965, while the 1878 Theatre Royal on Hindley Street also made way for a particularly ugly car park above Millers Arcade. It is without doubt, Adelaide's finest building and is considered by architects to be one of the best examples of its type anywhere in the world. Together with friend Perce Collyer, Charles Wright decided to bring this news to the attention of the public and raise funds to save this magnificent building erected in 1878. 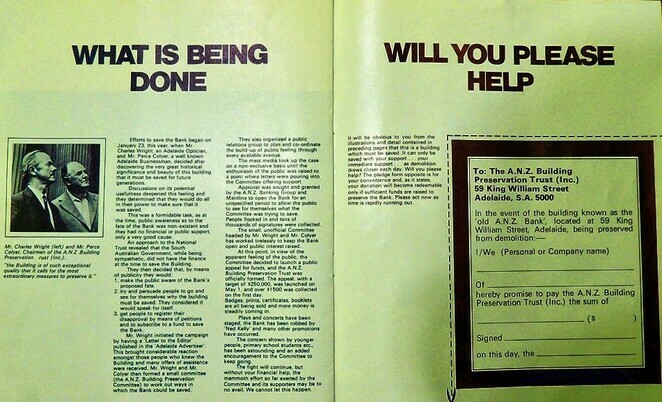 Wright published a passionate letter to the editor in The Advertiser and with widespread support, launched the ANZ Building Preservation Trust with the first meeting held on April 27 1971. Support for saving the bank building grew rapidly and a public appeal was launched on May 1, with 520 people signing a petition and $1,236 ($13,636 today) in donations being collected on the first day. The Preservation Trust were relentless in their drive for more publicity and funds. They obtained permission to open the bank building every day for the public to view, canvassed TV stations to broadcast live from the building, and sought to extend the appeal campaign into schools. 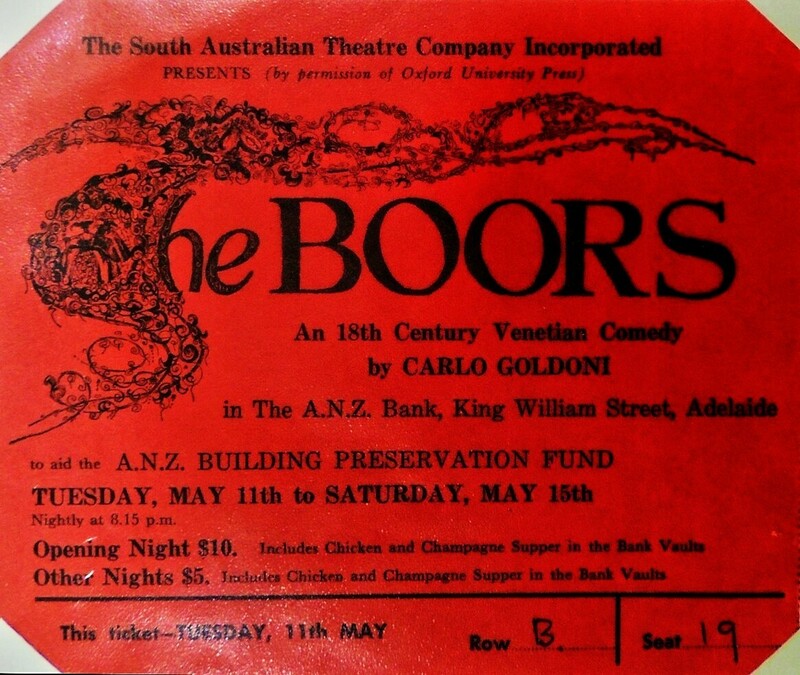 The South Australian Theatre Company held five charity benefit performances of The Boors in the ANZ bank building. 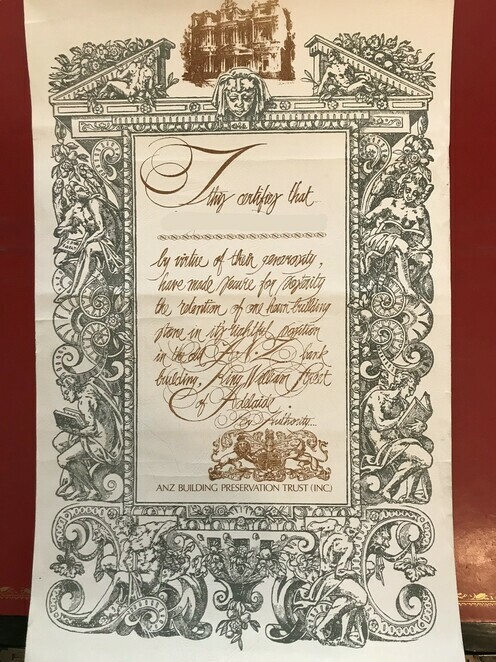 Many artists and performers supported the appeal with their own efforts: badges, prints, and certificates were sold, plays and concerts staged and a brochure printed with thousands of copies sold. 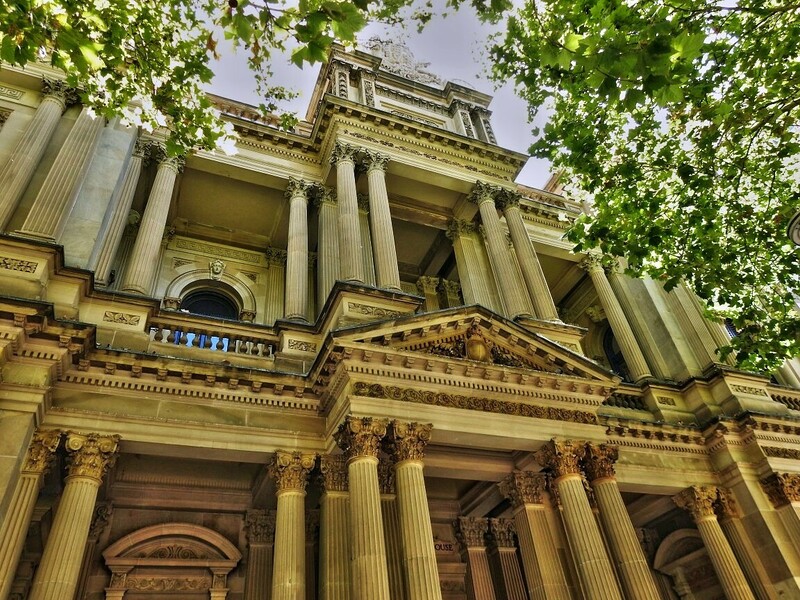 It took only 3 months for the ANZ Building Preservation Trust to raise their target of $250,000 to save the bank - equivalent to $2,758,158 in 2019. By this time Premier Don Dunstan had announced that the former ANZ bank would be saved by the government. The purchase price of the bank building - later named Edmund Wright House was $790,000. Money raised by the ANZ Building Preservation Trust was used to buy gold leaf for ceiling redecoration and special lighting in the banking chamber and the building was renamed Edmund Wright House in 1972. The extensive renovations of the former ANZ Bank took nearly two years to complete. 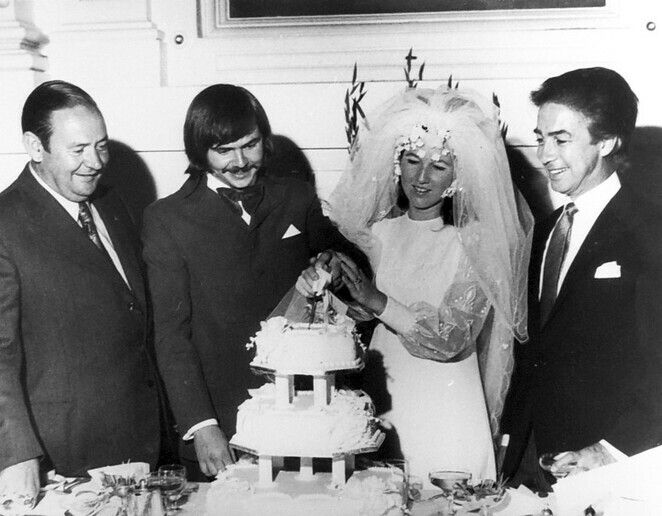 It was finally opened on March 3 1973 when a crowd of invited guests including Premier Don Dunstan and Opposition Leader Bruce Eastick attended the wedding of Denise Lee and David Richards at Edmund Wright House. Edmund Wright House was to become a highly sought after venue for weddings in Adelaide for many years, and home of the Registrar of Births, Deaths and Marriages. It later housed the State History Centre, part of the History Trust of South Australia, then subsequently the Migrant Resource Centre moved in for a period. The seven month battle in 1971 to save the former ANZ Bank from demolition was a turning point in the history of built heritage preservation in South Australia. The fact that such a magnificent building could be demolished with impunity, and that only acquisition by another party could save it, drove home to the community the need for comprehensive legislation to protect built heritage across the State. After being left vacant for years by the State government, they sought a buyer for this precious State heritage listed place. Edmund Wright House was sold to a Sydney investor for $6.3 million, but no information has become available yet about its future. The sale does raise the question - the South Australian public invested heavily in this building in 1971. Don't they have a rightful claim to part of the proceeds of sale? 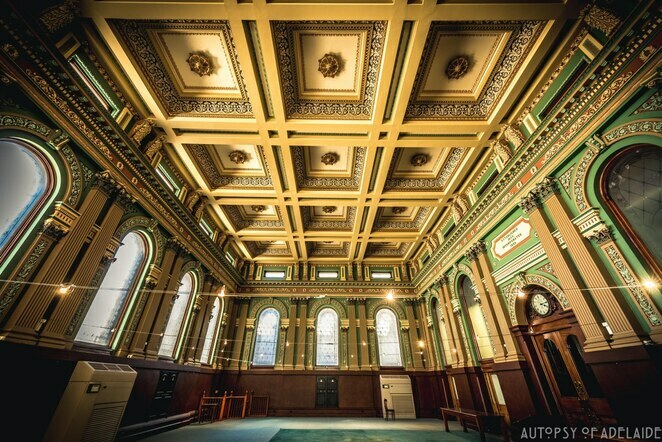 Surely the state government should contribute a substantial sum to the National Trust of South Australia to preserve our built heritage, in recognition of this part ownership by the public of SA? Great job, Dave. You're right to ask about the use of donations. I didn't know that, it deserves to be explored. it Is appalling that such a significant public contribution to the value of the building could have been ignored! Surely the public shouldâ€™ve been considered as having a 24% share in the buildingâ€™s ownership - and if the public could not prevent the sale, at the very least the relevant proportion of the proceeds should be made available to the organisation which would act to conserve similar heritage: The National Trust. May Charles Wright rest in peace - and not turn in his grave at the undermining of his efforts. What a magnificent effort they put in!